We Don’t Beg, We Demand: Full Citizenship Rights for All Immigrants! Forge a Revolutionary and Internationalist Workers Party! Ten days later, the United States Supreme Court issued its decision on Arizona’s sinister SB1070 law. In this case there was none of the delirious optimism which accompanied the Obama administration’s earlier action. 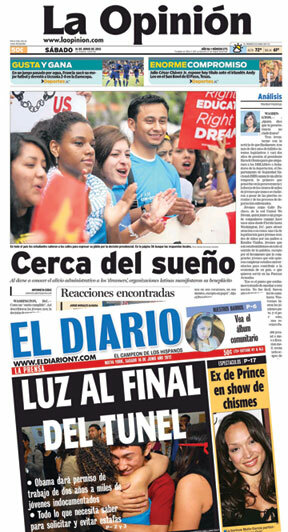 “Supreme Disappointment for Immigrants” headlined El Diario. Although the ruling rejected three of the disputed sections of the racist law, it did not disallow the key provision, which instructs police to ask people about their immigration status when they are being questioned about a misdemeanor or criminal offense, if the cops have a “reasonable suspicion” that they are undocumented. Obviously, this invites “racial profiling” of brown-skinned people or those who “look Mexican,” both immigrants (undocumented or “legal”) and citizens. Thirty percent of Arizona’s population is of Hispanic origin. 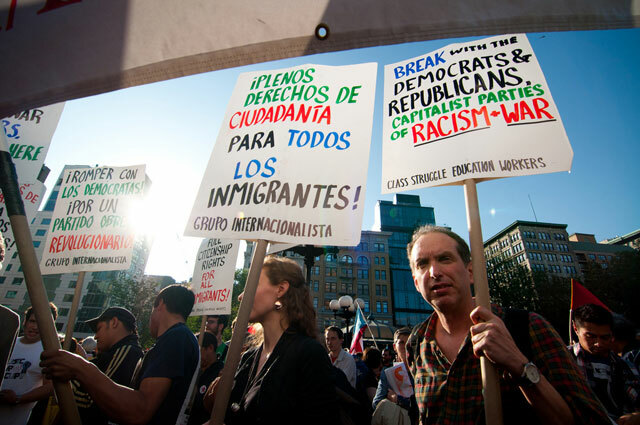 As we pointed out in our article, “Deportation Elections 2012: For a Revolutionary Workers Party!” (The Internationalist supplement, May 2012), immigration is a hot issue between Democrats and Republicans in the current presidential campaign. Hispanic and immigrants’ rights groups are assiduously using the Obama administration’s administrative action and the Supreme Court’s green light to the Republican-sponsored SB1070 to round up votes for the Democrats. But while Republicans are appealing for support from the most reactionary sectors of the white population with barely disguised xenophobic rhetoric, this doesn’t make the Democrats friends of immigrants. 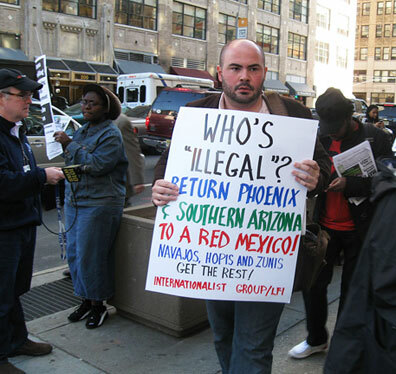 The Internationalist Group, U.S. section of the League for the Fourth International, warns against the fraud of a mythical “immigration reform” which won’t happen, certainly nothing favorable to immigrant workers, who constitute a huge and potentially militant section of the working class. We call for no votes to the Democrats, Republicans or any capitalist candidate or party. Only a workers party can lead a victorious struggle to defend immigrants. As we chant in demonstrations, “Ni ilegales, ni criminales, ¡somos trabajadores internacionales!” (Not illegal, not criminals, we are international workers). The IG fights for full citizenship rights for all immigrants as part of a struggle for international socialist revolution. So let’s briefly analyze the two latest measures: the deferred action on deportation of certain youth, and the implementation of the Arizona law. Obama’s 2008 campaign was based on weasel words like “hope,” “change” and “yes we can.” Today he is again selling false hopes and empty election promises. During the last two years, a movement has arisen of undocumented youth in support of the Dream Act. The campaign is led by a network of “non-governmental organizations” (NGOs) financed by liberal organizations in order to serve as a safety valve to vent the frustrations of a generation of youth who live in the shadows. Upon leaving high school, lacking the proper papers it is difficult for them to study in the universities or get a legal job. For their part, the Democrats want to give the impression that they are doing something about immigration in order to rev up the Latino vote in key “swing states” like Florida, Colorado, Nevada, North Carolina and Virgina. We have refused to support the national Dream Act because of a key provision which offers legal residence in exchange for serving in the military. This is an attempt by the Pentagon to recruit young immigrants in order to fill a gap in cannon fodder for their imperialist wars. But despite the generals’ testimony, anti-immigrant hysteria buried the Dream Act in the bowels of Congress and almost all the state legislatures. In the face of this failure, the Obama administration is seeking to profit from the sympathies by and for this sector, which is considered “innocent” even by many reactionaries. And with the young dreamers, who courageously came out of the shadows to affirm their identity, the maneuver worked. Many received the news of the action with tears in their eyes. But let’s look more closely at what was approved. Not only is it not an amnesty, nor permanent residence, nor a path to citizenship, it isn’t even an executive order. It was only an internal administrative memo from the secretary of the Department of Homeland Security (DHS), a sinister agency which is at the heart of the drive to intensify repression in the United States. Indeed, under both Bush and Obama, thanks to the DHS and its Immigration Control and Enforcement (ICE) police, undocumented immigrants in the U.S. are already living in a police state. And even if young people manage to qualify for deferred action, this measure could be withdrawn tomorrow if the DHS chief changes her mind, or if the Republicans win the elections. Immigration law specialists are recommending not to make use of the measure until after seeing the outcome of the November elections. Keep in mind that the government generally doesn’t know whether a young person is an immigrant or not. When they request deferred action, they enter the immigration control system. As a Phoenix-based immigration lawyer remarked, once in the system “they may not be able to get back into anonymity.” Moreover, they will have to hand over a stack of documents, informing the authorities of the whereabouts and immigration status of their parents; they will probably have to pay a stiff processing fee; and they will have to undergo a background check by the FBI. In practice, it is likely that only a small layer of middle class youth who are seeking to get a university degree will benefit from this action. For the bulk of the youth in immigrant neighborhoods it offers little or nothing. What those who are approved will receive, will not be an exemption from deportation but only a deferment. In contrast to the “temporary protected status” granted to Central Americans, the action announced by Obama does not change the immigration status of the youth concerned. It is only an “exercise of prosecutorial discretion,” deciding to temporarily not proceed with deportation. A year ago, the ICE director made a similar announcement, that on the basis of prosecutorial discretion in the future they would not deport “low priority” persons. He promised to review 340,000 cases in which deportation proceedings had already begun. But of the 200,000 cases examined so far, only 2% have been closed (Arizona Republic, 16 June). In other words, the result has been negligible. In strictly legal terms, the Court ruling has contradictory elements. It turned down Section 3 of the SB1070 law which would have made it a crime not to carry alien registration papers. So if a police officer in Arizona or another state demands to see someone’s papers, the person being questioned is under no obligation to produce documents. It also annulled Section 5, which would have made it illegal for an undocumented immigrant to ask for a job. The Court prohibited states from implementing laws on this issue, underlining that Congress, by making the employer responsible, “made a deliberate choice not to impose criminal penalties on aliens who seek, or engage in, unauthorized employment.” So it spelled out that day laborers who are harassed by the police, and not only in Arizona, are not violating the law in looking for work. The Court also struck down Section 6 of the law, which would have authorized the arrest without a warrant of individuals simply for being undocumented. In doing so, the highest court in the country reaffirmed in writing that, “As a general rule, it is not a crime for a removable alien to remain present in the United States.” This has been the case for many years, but it must enrage the xenophobes to see it reaffirmed in so many words, and by this ultra-reactionary Supreme Court. Nevertheless, while immigration law experts applaud these sections of the ruling, the supporters of SB1070 correctly emphasize that the Court let the key piece of law go into effect, Section 2B, which requires police officers to ask about the immigration status of anyone being questioned if they suspect that the person is undocumented. Even in this case there are limitations. It is not permitted to stop people simply to inquire about their immigration status. All this means is that the police will have to look for a pretext, but officers are already well-trained in doing that. It further stipulates that the stop cannot last longer than normal in order to verify the person’s status. But these are only questions of form. The most important thing is that the Court did not issue a decision on whether SB1070 violates the Fourth Amendment to the Constitution of the United States, which prohibits “unreasonable searches and seizures” which would be the case if individuals were stopped according to a racial profile. The Court didn’t rule on this key aspect because the U.S. Attorney General, who sought the injunction to stop the law from going into effect, didn’t ask it to. The Obama administration only objected to the Arizona law on the grounds that U.S. law preempts state legislation on immigration matters. There are several additional court cases by individuals and immigrants’ rights groups against SB1070, as well as the underlying federal case, which take up the discriminatory nature of the law. The Court accepted, even invited, that there can be “other preemption and constitutional challenges to the law as interpreted and applied after it goes into effect.” It is obvious to everyone that the main criteria for questioning someone about their immigration status is their ethnicity and physical appearance. As the sheriff of Santa Clara county admitted, “I’m dark-skinned and Hispanic. If you put me in tennis shoes and a baseball cap in the wrong place, they will ask me” (Arizona Republic, 26 June). However, an eventual judicial challenge doesn’t worry the supporters of the racist law. Nor are they bothered by the statements from the DHS that it won’t make detentions beyond its priority categories. The police are not authorized to arrest undocumented persons, nor is there space in the jails: there is already a tent city in front of the Maricopa County Jail to house some 2,000 people picked up in raids by Sheriff Joe Arpaio. What the law’s supporters are looking to accomplish is “deportation by attrition.” They want to make life unbearable for immigrants. They figure this would force them to “go home,” ignoring the fact that Arizona is territory stolen from Mexico in the first place. In any case, if undocumented immigrants leave, they won’t be heading south of the border but instead to elsewhere in the U.S. In the face of similar laws in Alabama and Georgia, thousands fled north. The fight to defend immigrants cannot be won – or even fought – on the bourgeois electoral terrain. This is fundamentally a class battle. The two parties of capital represent a system which profits from the superexploitation of millions of workers who lack even the most fundamental rights. If there are divisions within the ruling class over a mythical “immigration reform,” it is because the capitalists have contradictory interests concerning workers from abroad. On the one hand, they want to exploit their cheap labor on a large scale; on the other, they don’t want the exploited to be able to resist. The bosses’ preferred solution would be a system known, with hair-raising euphemism, as “guest workers” – i.e., contract workers, like the braceros program during and after World War II. Thus in this epoch of capitalist decay the bosses are introducing forms of forced labor characteristic of the era of brutal primitive accumulation of capital. Contracting workers without rights recalls the servile labor systems of debt servitude of white workers in the North American colonies, and the system of peonage which replaced the encomienda in Mexico. There is no better proof that the capitalist system is rotting, at an accelerating pace – contrary to the starry-eyed reformists who think that the productive forces are still growing – with the destruction of unions, elimination of social programs and trampling underfoot of democratic rights won in centuries past. An authoritative spokesman for U.S. imperialism, Bill Keller, former executive editor of The New York Times, for example, proposes to adopt a national identity card that would include biometric data. He wants to thereby introduce a method of control favorable to a police state for everyone. This is what the “enlightened” bourgeois yearn for. The more barbaric types prefer directly fascist methods, as in the case of the “Minuteman” immigrant hunters. But repression carried out by a few paramilitary militias, or even by the Maricopa County sheriff (who detained 38,000 undocumented immigrants up to the end of 2010) cannot even be remotely compared to the one million immigrants thrown into ICE detention centers in Arizona every year. By far the biggest repressor of immigrants is the liberal Democrat Barack Obama. The immigration police, the hated migra, are a repressive apparatus that is racist to the core, particularly against Latinos. Although 58% of the 11 million undocumented residents of the U.S. (according to official estimates) are of Mexican origin, they constitute 73% of those deported, while 97% are Latin Americans. In short, the immigration policies of the Obama administration are a Latino removal program, and of Mexicans in particular. The government has also targeted Arab immigrants and those from south Asia. Not only that, under the “Secure Communities” program a third of those deported have spouses or children who are U.S. citizens. And even though ICE says it is focusing on “criminals,” last year immigrant defense groups in Boston showed that half of those deported under this program were stopped for traffic violations. The Boston mayor fears that if the Secure Communities program continues, “people will say that the police are Gestapos,” referring to the feared secret police of fascist Germany. In point of fact, the migra is a Gestapo, a police force dedicated to repressing a whole section of the population (Jews and communists in Germany, undocumented immigrants here), which carries out mass arrests of people who have committed no crime and packs them off to concentration camps (here called “detention centers”). It’s hardly accidental that the black uniforms and heavy armament of ICE (they even have tanks) starkly resemble those of the Nazi SS storm troopers: in both cases, the aim is to intimidate. And despite all the protests, the Obama administration is defending the “Secure Communities” program against all criticism. However, the capitalist ruling class cannot resolve its “immigration problem” with police methods. The New York Times (17 May 2005) concluded that “deporting all of the estimated 12 million illegal immigrants in the United States would not be feasible.” It cites the lack of police personnel and the cost of new detention centers (there are now about 1,000 of them). But the bigger problem for the bourgeoisie is that the U.S. economy can no longer do without these millions of workers. Foreign-born workers constitute more than 15% of the entire U.S. labor force. The percentage is even higher in certain jobs, such as agriculture (35%) and construction (27%). 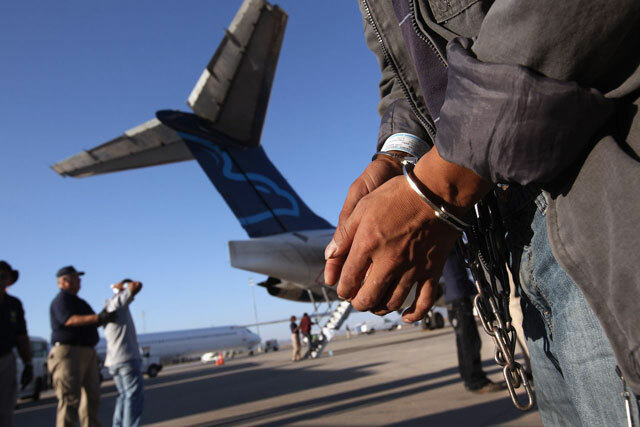 Massive deportations would lead to a collapse of whole sections of the economy. It is here, in the economy, where immigrants’ strength resides, in their capacity as workers. Beyond the institutionalized fraud of every bourgeois electoral system, in which the enormous sums invested in it by the capitalists determine the results, immigrants, “legal” or undocumented, don’t vote. But they do produce value and create the wealth which is appropriated by the capitalists through their control of the means of production. 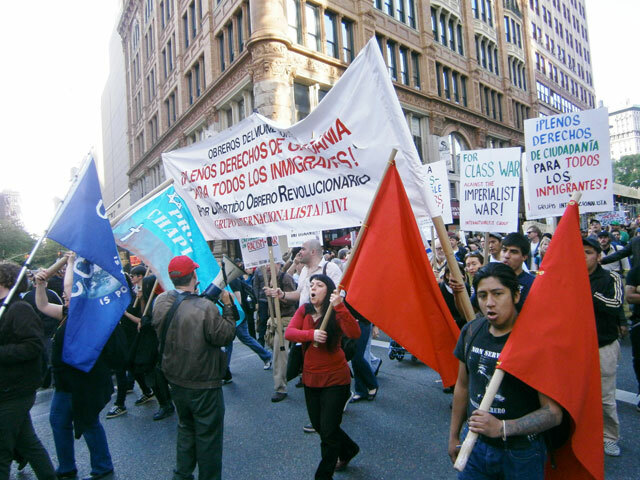 The power of immigrants as workers was seen in the “general strike” of 1 May 2006 against the pernicious Sensenbrenner bill (HR 4437), which was quickly shelved in the Senate as a result of this show of force. Even the Catholic church joined in calling for that unprecedented mobilization, but no more. To assert the rights of immigrants, it is necessary to organize their power, and then use it. Trade unions can play an important role in this. If in the past unions controlled by bureaucrats representing a labor aristocracy promoted xenophobic policies, accusing immigrant workers of “stealing American jobs,” today immigrants make up more than 12 percent of union ranks. The action by unions and unionists in Portland, Oregon, who adopted as an official slogan for the May Day 2012 the demand “full citizenship rights for all,” is an important step in this direction. But it is not enough. Defense of immigrants cannot be limited to demanding this or that reform. Immigrants are persecuted not only by reactionary elements, but also because the capitalists need an “enemy within” in order to whip up the population for their imperialist wars. During and after World War I, there was the “red scare” against communists, anarchists and immigrant workers, especially Italians. In World War II, citizens of Japanese origin were locked up in concentration camps. In the current “war on terror,” which has already gone on more than a decade, immigrants are the target of choice. In order to defeat this war on immigrants it is necessary to forge a workers party capable of waging the battle against the representatives of capital and their state. The state-level Dream Acts generally lack this clause, and thus we have taken a different position toward them (see the note in The Internationalist supplement, May 2012, p. 2).